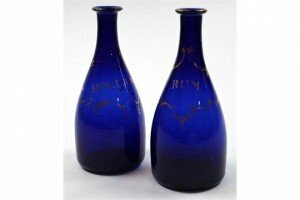 A pair of 18th century Bristol blue glass decanters, decorated in gilt writing Rum and Hollands on either bottle. 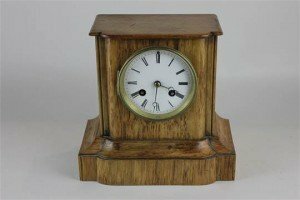 A 19th century French eight day mantel clock by Martin, Paris, with oak case, white enamel dial with Roman numerals. 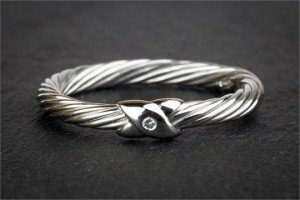 An 18ct white gold and diamond ring, the rope twist design band inset with a single brilliant cut diamond in a crossed ribbon setting. 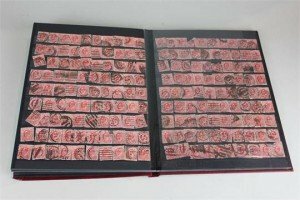 A full stamp album of British penny and half penny stamps all from 1905. 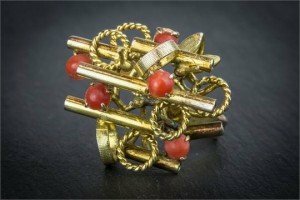 A modernist 18 carat yellow gold and coral cocktail ring, the avant garde setting combining bars, loops and foliage, set with five cut coral beads. 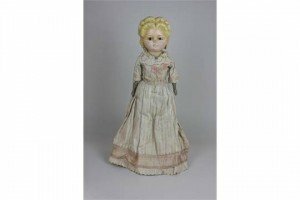 A Victorian wax over composition pumpkin head doll with moulded hair and pierced ears, brown glass eyes, wooden limbs, in original costume with necklace and earrings. 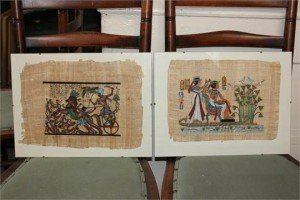 Two reproduction Egyptian oil paintings on papyrus showing a boat on the Nile and a man in a chariot. 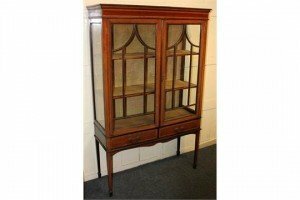 An Edwardian inlaid mahogany display cabinet with panel glazed doors enclosing two shelves above two short drawers, on square tapered legs with spade feet. 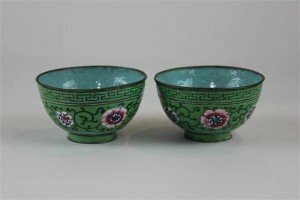 A pair of cloisonné bowls enamelled in bright blue and greens with floral designs. 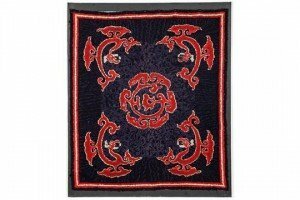 Antique American Hooked Rug in Asian Inspired Design: four red dragon-like forms circling a central medallion on black field. 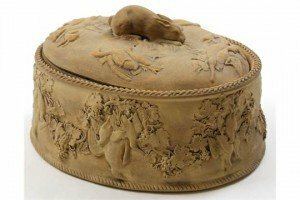 Wedgwood cane ware game pie dish, liner and cover moulded in relief with game birds, rabbits and vine swags. 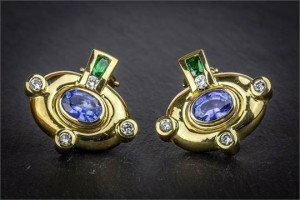 A pair of 18ct yellow gold, Tanzanite and diamond earrings, the oval setting with collet set oval cut Tanzanite. 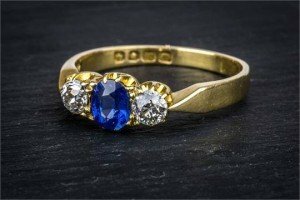 An Art Deco period 18ct gold, sapphire and diamond three stone ring, the central oval cut cornflower blue sapphire flanked by old brilliant diamonds, within tapered shoulders. 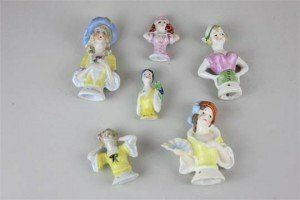 Six 20th century porcelain half dolls, one with a fan, another in a hat and one with a parrot on her shoulder. 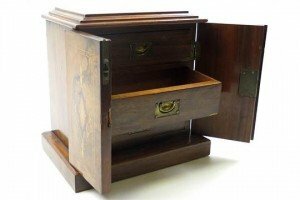 19th century table cabinet, with double locking doors revealing 3 drawers behind an extensively inlaid burr walnut veneer. 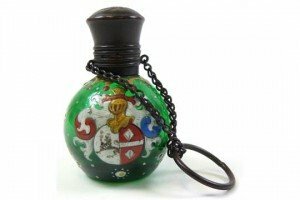 An unusual 19th century green glass perfume bottle with a heraldic shield painted to one side standing. Swarovski Fine and Impressive Cut Crystal Statement Necklace with Matching Earrings. Each Stone Is Set In Sterling Silver Plate. Boxed. 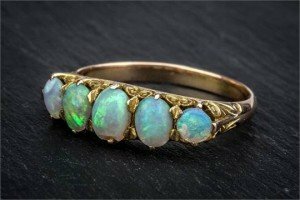 An antique yellow gold and opal five stone ring, early 20th century, the scrollwork setting with five oval graduated opals. 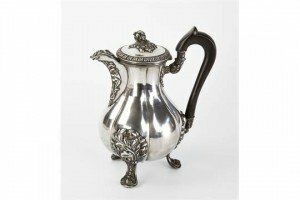 A Continental silver coffee pot of segmented bulb design, circular hinged lid with floral and foliate finial and gadrooned design to edge, ebony handle on three scroll supports. 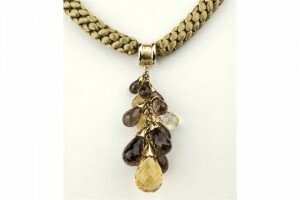 A two-colour gold, citrine and smoky quartz briolite cut pendant, the pendant suspending four citrine and ten graduated smoky quartz drops from a yellow gold chain.